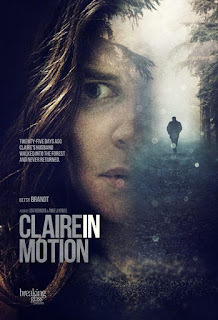 “Brandt impresses in this sensitive moving-on drama"
Breaking Glass Pictures will release the upcoming psychological drama/thriller CLAIRE IN MOTION on DVD April 14, 2017. Three weeks after Claire’s husband has mysteriously disappeared, the police have ended their investigation and her son is beginning to grieve. The only person who hasn’t given up is Claire. Soon she discovers his troubling secrets, including an alluring yet manipulative graduate student with whom he had formed a close bond. As she digs deeper, Claire begins to lose her grip on how well she truly knew her husband and questions her own identity in the process. Claire in Motion twists the missing person thriller into an emotional take on uncertainty and loss. CLAIRE IN MOTION is the second feature film by filmmaking team Lisa Robinson and Annie J. Howell ("Small, Beautifully Moving Parts") and stars Betsy Brandt (“Breaking Bad”, “Life in Pieces”) in a breakthrough performance that twists the missing person thriller into an emotional take on uncertainty and loss. With this film, we were interested in telling a story about something that’s been lost — both physically and spiritually. It was intriguing to give Claire a life crisis that leads to a bigger mystery, one that unravels her perception of all she knows to be true. We wanted this experience to be closely observed, and to bring intimacy to every element of the film: the acting, the landscapes, and especially the camerawork. The world of the Appalachian Ohio college town where the story is set, with its lonely streets and manicured homes, imposing rocky cliffs and dark forests, are all filtered through Claire’s slowly destabilizing mind. Her quest to understand her shifting world after a crisis is a metaphor for universal questions: How do we keep changing throughout our lives? How does our own change and behavior surprise those closest to us, or even ourselves? Can we ever really know anyone? These were the ideas that we explored through the writing and directing of Claire in Motion. Claire's husband says goodbye to her in the morning telling her that he is heading out to the woods. He has been doing this lately. Just going out and living off the land. Maybe it has always been a passion or maybe it is a change of life thing but she has become use to him not coming home for a while sometimes even days. She doesn't seem too worried as she continues on her day, puts her son to sleep and eventually heads to bed herself after running outside when she hears a car and realizing it isn't him. In the morning he still hasn't come home and she knows something is not right and she needs to contact authorities. The movie is about what happens when someone disappears and the family is left behind to piece together what is learned while the investigation is going on and maybe how little they knew about their loved one (Allison grad student who may or may not have been involved with Claire's husband) and how they may have or may not have contributed to their disappearance. Well acted, decent story but I found myself wanting to shake Claire and punch Allison.